Katt guarantees his stand-up show audiences an experience that will stimulate further conversation after his curtain closes. Look for articulate, quick-witted dialogue featuring names like Trump and Cosby that is rooted in evergreen conversations about politics, race relations and police brutality— all a mere mirror reflection of the American cultural landscape. Born on September 2, 1971 in Cincinnati, Ohio, Katt grew up in Dayton. Strong-willed and self-motivated even as a young man, he became emancipated at 13 and relocated on his own to Florida where he worked as a door-to-door salesman. Encouraged by his early success, Williams committed himself to fine-tuning his God-given talent— a unique comedic delivery audiences had not yet witnessed— by performing his routines in clubs all over the country. By 1999, he had become established in the pantheon of great African-American comics that also includes Eddie Murphy, Martin Lawrence, Dave Chapelle and Chris Rock. KW: I'm honored to have this opportunity to speak with you. Katt: Oh, thank you. I appreciate it. KW: What interested you in Father Figures? Katt: When I read the script, I instantly understood that it was somehow funny and yet also touching. It really felt like something substantial. The only question was whether it would be cast correctly. Then, when you hear it's going to be Owen Wilson, Ed Helms, Glenn Close, J.K. Simmons, Christopher Walken, Terry Bradshaw and Ving Rhames, it's like, "Wait a minute! This is exactly what I was hoping for. So, I was "in" all through the process. KW: Once again, you've managed to have the most memorable scenes in a movie, even in a support role. Katt: Thank you, Kam. I'm always trying to wring as much, comedically, out of a performance as I possibly can. This role was different because it called for the exercise of a different muscle. It wasn't just about, "More! More! More! More!" This film called for me to start with absolute constraint, to start at 0 and gradually accelerate from there. I appreciate the acting lesson within it. KW: What would you say is the message of Father Figures? Katt: It's twofold. On the most basic level, it's about not judging a book by its cover. That all close friends start out as strangers. That's the beauty of the situation we're in on this planet. We have the opportunity every day to meet someone we didn't know who might become an integral part of our life that really matters. The second message is that we all have holes in our souls, and that we'll be better people when we figure out how to fix those holes. So, it's also about people trying to be more complete. And that's a wonderful story to tell any time of year, but especially during the holiday season. Katt: I've always felt that way. I've sensed, at my best moments, that I was being led. So, I know that sort of protection exists. I also know that there are some people who are much more in tune with the universe than the rest of us. and their lives are evidence of that. Katt: I can remember thinking, at the age of 3, that I invented the concept of lying. By a brilliant thought process, I figured that I could fib and avoid the repercussions for something I had done, because lying meant that it never happened. However, by the time I was 5, I came to hate lying and to think of it as the worst thing in the world. That's my earliest memory. Weird, but true! KW: The Morris Chestnut question: Was there any particular moment in your childhood that inspired you to become the person you are today? Katt: No, I could only envision myself doing something that was important to people. But years later, when comedy came into my life, I was so ready for it. I had already watched the great comics. It had just never occurred to me that that was something I could be doing, too. Coming from that to this was a lot and it makes you forever grateful. KW: What's on the horizon for you. More movies, more TV, more stand-up? Katt: All of the above. I just finished an episode of Atlanta, and I have a Netflix special dropping January 16th called Great America. And I've just wrapped Meet the Blacks 2: The House Next Door with Mike Epps, Lil Duval, Bresha Webb, Zulay [Henao] and company. And right now, I'm just finishing up #TwoMinutesofFame with Jay Pharoah, Deon Cole and a bunch of great comedians. KW: What happened to Jay when he joined SNL? I was expecting big things from that marriage , because I knew he was so talented. Katt: It's delicate when you're using his set of skills for comedic purposes. It's not the easiest thing to do. and that's why he struggled on occasion. But when it's done right, it's perfect. Jay's a rare talent, and I'm sure Saturday Night Live was just the start for him. Katt: I hesitate to use the word "favorite", because I'm a fan of so many great fashion designers. However, I'd say Tom Ford, as an organization. They get me and the way I like to dress. I like a little edge and a little flash. But I do like to be grounded in conservatism, and Tom Ford has never delivered me a bad product, ever. Katt: I see someone who has managed to stick around for this amount of time without literally scraping their potential. Katt: [LOL] I'm able to behave like the guy you see onstage although that's not my entire existence. I might be a portion of that guy. At home, quiet prevails. It's incense, candles and birds chirping. Everything's done to maximize peace and tranquillity, because we know when we exit those doors, it's going to be a whole different energy. Katt: [Laughs some more] There are a whole of list of questions. Listen, parodies of me have been done 7 or 8 times on SNL. 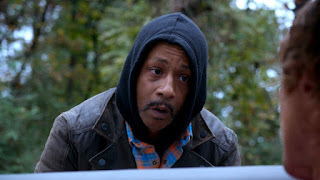 Every time they want good black ratings, somebody's doing Katt Williams. Jay Pharoah... Michael Che... Leslie Jones... Drake... Tiffany Haddish. with each of them, we've had a Katt Williams sighting, So, here's a question I wish somebody would ask: How many impressions of you should they do before finally having the real Katt Williams on Saturday Night Live? KW: Well put! Why do you spoof somebody so many times without inviting them on? The Anthony Mackie question: Is there anything that you promised yourself you’d do if you became famous, that you still haven’t done yet? Katt: Oh, no. Absolutely not! Those were the first things that got done. I was so grateful to God, I did make sure I kept all my promises to Him, up front, of what I'd do in return for being successful. Katt: I hesitate to say, because I put it out there, someone else might jump on the idea. Although, I think it's a great time to redo Trading Places. Katt: Turkey. Turkey is a big deal because it's so obvious when it's not right, and just as obvious when you've nailed it. I like those recipes that a lot of work goes into. KW: Making a movie is like that, too. Do you have any interest in directing? Katt: Yeah, I was never the same after I saw Bram Stoker's Dracula. Katt: Invisibility. That's the only thing that fame cost me. I used to be able to go places and blend in. Anonymity is something you lose on this side of things. KW: Can you go to a movie theater or a supermarket? Katt: Not unless I'm prepared to be Katt Williams. KW: If you could travel back in time, what advice would you give your 13 year-old self? Katt: I would reassure him that he was on it, and to trust his instincts about what he intended to bring . and I would tell him not to give away all of your stories before it's time to, if you intend to have longevity. Each of those movie ideas you have, could turn into $100 million apiece, if you don't share them before you make it. Katt: I have yet to meet someone who was successful who was even slightly negative. That comes from a muscle training. You can work on negativity and weed it out of your life. I've noticed that all of the people who acted as if they were going to be gone too soon, were gone too soon. Katt: [Chuckles] Just as a lover of the truth. Katt: My ID, a SAG card and a little cash. KW: Thanks again for the time, Katt, and best of luck with the film, the stand-up special and your other endeavors. Katt: Thank you, Kam. Nobody does it better than you. You got something accomplished, here. I've never had a conversation like this with anybody else, for sure.